High-resolution textures and advanced lighting allow for views of the heart in incredible detail. The graphics and real-time audio of the heartbeat combine for a truly immersive learning experience. Zoom in even further and explore a second model; the detailed anatomy of blood vessels. 3D4Medical’s cutting-edge technology and patented state-of-the-art tools make it possible to seamlessly cut through multiple layers of the beating heart as it moves, allowing for a dissection through the model while simultaneously viewing the functions of its internal structures. This is a revolutionary feature of Complete Heart - something not currently possible using conventional teaching methods. View the ribs, lungs and diaphragm in the context of the heart. 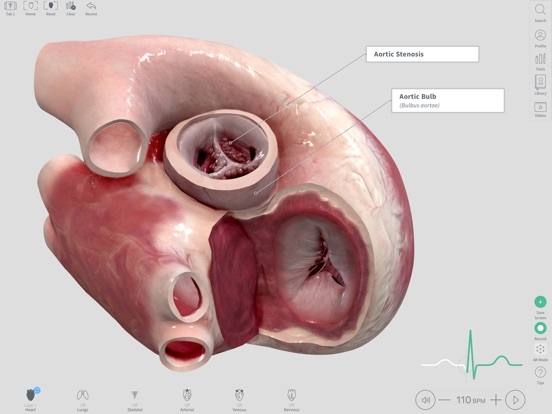 Complete Heart also features ground-breaking AR technology, allowing the user to place the heart on a surface in their real environment to gain a better sense of scale. This app includes educational clinical tools including an interactive ECG, which can be controlled to see different stages of a heartbeat represented on the model. Additionally, by altering the BPM of the model in real time, the heart-rate can be set to simulate real scenarios, including arrhythmias such as tachycardia and bradycardia, all while continually interacting with the anatomy. 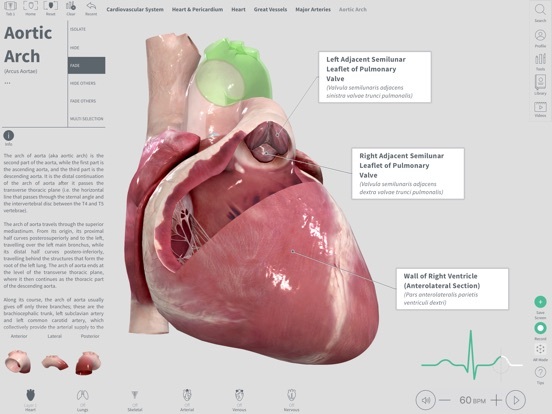 Check out our comprehensive video library for over 60 detailed animations on an incredible range of cardiac conditions and treatments. These range from abnormal rhythms and valve abnormalities to coronary artery diseases, and include key procedures performed to treat them. Not sure where to start? Why not take an introductory Course on the ‘Anatomy of the Heart’, created by top anatomical experts and included in the price of the Full Version Upgrade. 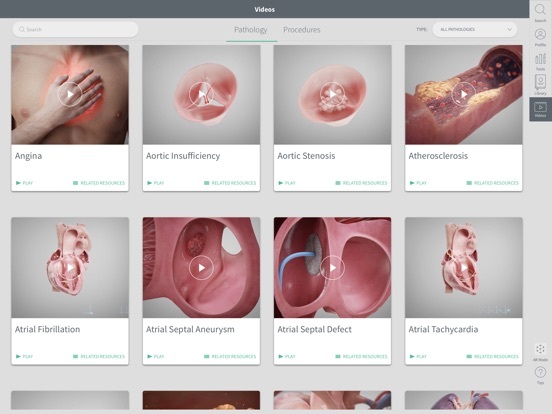 Also included in the app is educational content in the form of interactive Screens, which cover topics from basic anatomy and physiology, to detailed information on clinical and surgical procedures. 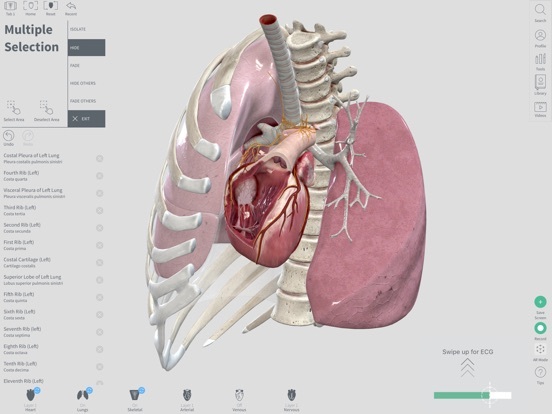 As with other apps in the Complete Anatomy series, the platform provides innovative ways to transform traditional 2D learning material into 3D, with features such as anatomy ‘Screens’ creation, a 3D recording feature (with audio) and quizzes on the anatomy of the heart. 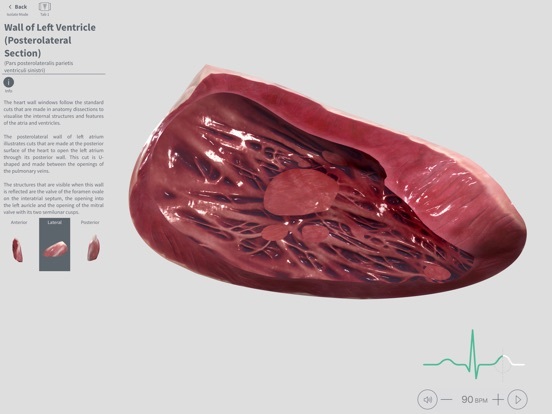 Experience anatomy through stunning visualizations - download Complete Heart today! The anatomical precision and accuracy of the beating heart has been improved! Significant improvements to the Cut Tool mean that it now cuts the heart 10 times faster. Small bug fixes throughout the app to improve general usability and performance.